National Conference, where to begin? It all started last summer when Drexel’s PRSSA chapter found out we could submit a bid to host this year’s conference. Because I was originally planning to study abroad this summer, I contributed to the bid but wasn’t planning to be a part of the Conference Committee (how could I help plan a conference from Italy?). Flash to after our chapter presented the bid in California at last year’s conference and won. There was a gap in the planning committee for Programs Director and I had to take it! My name was submitted with the rest of the planning committee, and we were officially the new hosts of PRSSA’s 2013 National Conference. Last fall we spent time gathering information on potential speakers, finalizing the conference’s theme (we went with “Foundation for Innovation”), and prepping other materials for our first in-person planning meeting with PRSA headquarters. In February we spent two days at the Loews going over conference details, discussing speakers, thinking about logistics, and outlining our promotion plan. After our in-person meeting, the following months consisted of more speaker research and outreach, thinking about how our socials would pan out, and lots more. Our committee held bi-weekly meetings as well as frequent conference calls with headquarters. Not only were we figuring out who should speak at the conference, but we also were doing outreach for sponsorships…you can’t host a five-day conference without a budget! As time ran low with the dwindling summer months, we started to have weekly meetings and biweekly conference calls. Then, the weekly conference calls kicked in. By this point, say mid-September, most of our speakers were confirmed as well as sponsors – minus two or three final confirmations. October was packed with finalizing volunteer schedules, weekly meetings, more conference calls, coordinating entertainment, picking up swag bag items, and much more! October 24th hit and I found myself moving into the Loews for a six-night staycation. Aside from coordinating the Friday night social, introducing speakers, and managing the hospitality desk, our committee networked and connected with peers from around the nation. One of the best parts of PRSSA is all of the connections that can be made during national events. Being Programs Director was a huge responsibility, a lot of work, demanding, and also a lot of fun! Seeing conference attendees learn from professionals, connect with peers, and enjoy Philadelphia made the year-long commitment worth my efforts. This is a guest post written by Ian Michael Crumm. Ian attends Drexel University and serves as Vice President of Drexel’s PRSSA chapter. When he isn’t busy with school and PRSSA, Ian also runs his own blog, where he posts about all things fashion. 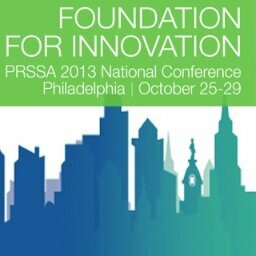 This entry was posted in College Relations, Current Events and tagged National Conference, Philadelphia, Philly, PR, PRSA, PRSSA, Public Relations, Students by pprablog. Bookmark the permalink. Awesome job with the conference, Ian! I loved reading this post and getting a behind-the-scenes look at what it took to plan the conference.